Goodness gracious, are these muffins delicious! 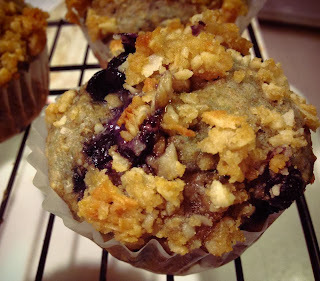 They're packed with lots of different flavors that blend very nicely into a moist, crunchy but yet soft, delicious muffin. I found the recipe on EatingWell.com, through a google search looking for healthy but yet delicious brunch-type items. I gave this recipe a try last night and on all accounts, it is a fabulous recipe. I didn't have any problems with the batter, not baking time. The only problem I had was waiting the suggested time after they came out of the oven. I still burned my mouth a little because I couldn't wait, but it was definitely worth it! 1. Preheat oven to 375 degrees. Coat a 12-cup muffin pan with cooking spray. I used baking liner cups and sprayed them with spray. 2. Combine all topping ingredients and set aside. 3. Mix together flours, baking soda, baking powder, salt and cinnamon in a medium bowl. 4. Whisk brown sugar, oil, egg, egg white, buttermilk and extract in a (different) medium bowl until well combined. 5. Make a well in the center of the dry ingredients and pour in the wet ingredients and stir until just combined. 6. Add blueberries and remaining macadamia nuts, stir just to combine. 7. Divide batter among the muffin cups (about 1/4 c. of batter per muffin). Sprinkle and gently press the topping on the tops of the muffins (about 1 tsp. per muffin). 8. Bake muffins about 20 minutes, or until golden brown and a toothpick inserted in the center comes out clean. 9. Let cool in the pan for 10 minutes, then remove from pan and let cool on a wire rack at least 5 minutes before serving.